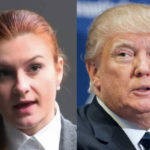 Last night Palmer Report brought you the story of how Donald Trump and/or his allies were floating the desperate and unrealistic scheme of shipping alleged Kremlin spy and confirmed NRA operative Maria Butina off to Russia in some kind of spy swap. We noted that this was coming even as Butina was on the verge of a plea deal. Now, in a magnificent fit of timing, the illegal financial connection between the Trump campaign and the NRA has been blown wide open. The 2016 Trump campaign and the NRA were breaking just about every federal election law on the books by directly coordinating on the NRA’s multimillion dollar advertising campaigns, even going so far as to meet at Trump Tower in order to plot things out, according to a lengthy new bombshell from Mother Jones. This confirms what we have all long suspected: Trump and the NRA were illegally in bed with each other during the election. So what does this have do with Butina? That’s the big question. The Mother Jones expose doesn’t mention Maria Butina. But she appears to have been a linchpin connecting the Kremlin, the NRA, the Donald Trump campaign, and the Republican Party during the 2016 election. If this is a coincidence, it’s a remarkable one. We suspect it’s more likely that someone with inside knowledge of the Trump-NRA conspiracy has concluded that Butina is about to blow the lid off it anyway, and is leaking it accordingly. In any case, this is the latest sign that things are now unfolding at an accelerating pace across all fronts of the Trump-Russia scandal and investigation. Now we have a clear-cut criminal financial conspiracy between the Donald Trump campaign and the NRA. Butina should be able to help prove the widely suspected similar link between the NRA and Russia. This would draw a money trail straight from Trump to the Kremlin.